AAA Automotive recently put out a really nice overview of the various advanced driver assistance systems on the market and how they could raise collision (or glass) repair costs. It’s an insurance industry validation of the importance of following automaker repair procedures for calibrating a car — even when it raises severity or requires OEM parts — and both shops and carriers should check out the Nov. 22 post. Putting safety above cost is a good message for the insurance and collision repair industries to hear from AAA. But the article also provides a solid introduction to the various ADAS systems and their calibration for shops and adjusters struggling to catch up or who haven’t yet seen many of these features on their local fleet. We guarantee you will soon. AAA and fellow insurers might in the end still catch a break on cost. A recently shared study by Honda and Allstate challenges the conventional wisdom that ADAS equals lower crash frequency but raises repair severity. 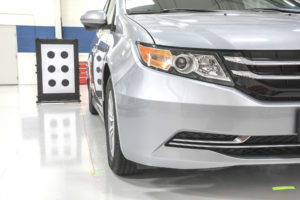 The OEM and carrier found that severity fell as well on 2016 Honda Civics equipped with the Honda Sensing ADAS suite, down 7.76 percent. The percentage of nondriveable vehicles also dropped — also a likely money-saver for a carrier. Honda has hypothesized that the technology is reducing the intensity of crashes enough that the insurer still comes out ahead on the deal. For example, a base-model Civic and one with Honda Sensing can’t avoid a crash. The one with ADAS sees the autobraking shave 5-10 mph off of the car’s velocity before the inevitable impact. That can matter.